BRIGHTON, Mich. - The Ford Flex is known for being a roomy, luxurious vehicle that is both a stylish and comfortable ride - the newest model is no exception. With only a few slight changes, our 2014 Ford Flex Review will get you up to speed with everything you need to know about this beautiful vehicle. 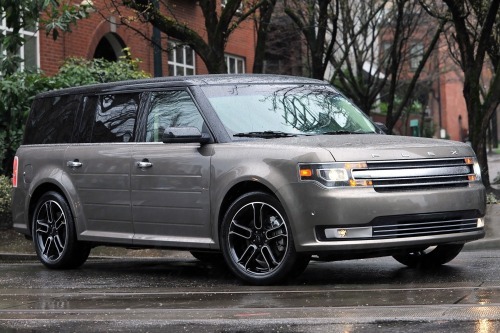 When it comes to space, the 2014 Ford Flex is hardly lacking. The 2014 model can seat up to 7 people comfortably, as it provides the same amount of passenger space and cargo room as a minivan - all while looking sleeker and more luxurious than the vehicle that is typically associated with soccer moms. The interior is not only spacious (holding up to 83 cubic feet behind the first row) but luxurious too. It has heated second-row seats that can slide forward to allow even the six-foot adults to sit comfortably in the third row. As for safety, the Ford Flex comes standard with antilock disc brakes, stability and traction control, front side airbags, side curtain airbags and rear parking sensors. A rearview camera and a blind spot warning system are optional, along with second-row inflatable seat belts. The Insurance Institute for Highway Safety Testing gave the Flex a top rating for how it performed in moderate-overlap frontal-offset, side-impact and roof-strength tests. It's safety features are only rivaled by the 2014 Ford Flex's powertrain and performance, as it comes standard with a 3.5-liter V6 engine that produces 287 hp and 254 lb.-ft. of torque. It gets up to 25 mpg on the highway and 18 mpg in the city and can go from 0-60 mph in 6.6 seconds. Not to mention, if you need a vehicle that is spacious with great towing capabilities, the Ford Flex can tow up to 4,500 pounds. That's pretty impressive! We hope this 2014 Ford Flex Review has convinced you of the Flex's strengths - if it hasn't, we recommend taking this vehicle out for a test drive so you can experience it for yourself! We also have a great selection of New Ford Trucks and New Ford Cars at your Farmington Area Ford Dealer, so no matter what you're looking for, stop on by and we'll be glad to help you out! Brighton Ford is located at 8240 Grand River Ave. just north of I-96 in Brighton. We are a family owned and operated business that is committed to customer satisfaction. For more information on Brighton Ford visit BrightonFord.com or give us a call at (800) 836-8206.